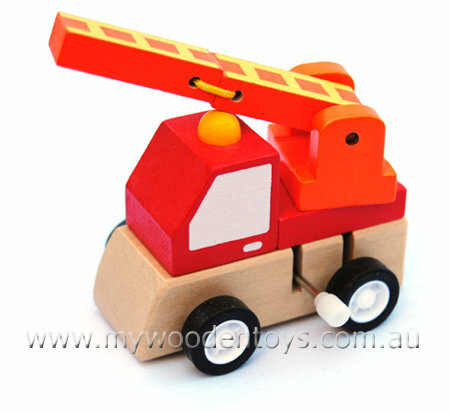 Wooden Wind Up Fire Engine is a great little red clockwork vehicle with a strong motor and rubber wheels. This Fire Engine has an extendable ladder held together with strong elastic and is attached to the back of the truck in such a way that it can turn 360 degrees. This is a wonderful little toy which is very strong and runs on one full wind for a long time. Size: 7cm long x 5cm wide. ladder extends to 7cm long. We like this because: "Strong sturdy... A windup fire engine.. it doesn't get better." Thanks Doug & thanks for calling this morning - I'm never sure when I will get to check emails & your call put my mind at ease SO much! You sound like a lovely man which would flow to your business. Your offer is a VERY kind gesture & one I didn't expect. Your actions speak mountains & I will not hesitate to buy from your online store again!